Linear straight and curved banner wall This linear wall easily set up and attract visitors to your stand thanks to its visual impact. Delivered in a bag for convenient transportation ! Free Printing ! Popup stand This large-sized wall can be usually used in exhibitions as a photo wall, or in various points of sale. The simple assembly without tools guarantees a fast installation. Popup stand available in 3x3, 4x3 or 5x3 fields Delivered in a bag for convenient transportation ! Free Printing ! 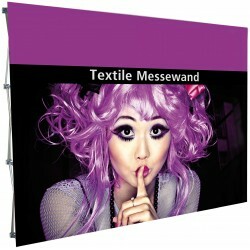 Image wall in stretch fabric This image wall in stretch fabric is very light and will be perfect in order to constitute the basis of your reception stand. Quick delivery ! Personalized printing on one or both sides ! Very easy mounting ! Inflatable stand wall This inflatable stand wall delivered with its pump will allow you to propose to your prospects and customers an original and very impacting reception stand! Dimensions: 2,40 x 2,20 m Delivered with its pump and its trolley! 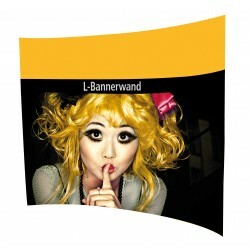 Personalized impression quadri-front or both sides!Easy transport and assembly! 1 177,00 €	tax excl. 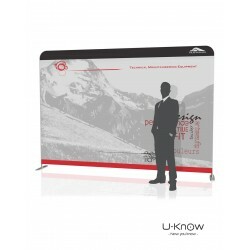 Popup display stand This wall which unfolds and folds easily is designed for a fast and effective organization of your trade shows or exhibitions, and with a guaranteed visual impact. Delivered in a bag for convenient transportation ! Free Printing ! 1 299,00 €	tax excl. 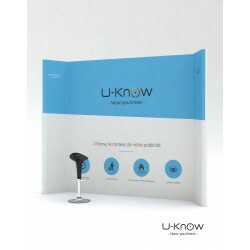 Pop-up half rounded exhibition wall This exhibition wall which unfolds and folds very easily is designed for a fast and effective organization of trade shows or exhibitions, and with a guaranteed visual impact ! Delivered in a bag for convenient transportation ! Free Printing ! Exclusive products ! Design wall made ​​of aluminum tubes and custom panels for a huge visual impact. Lights, easy to assemble and custom design.